Oh man, what a time we had in Oman! 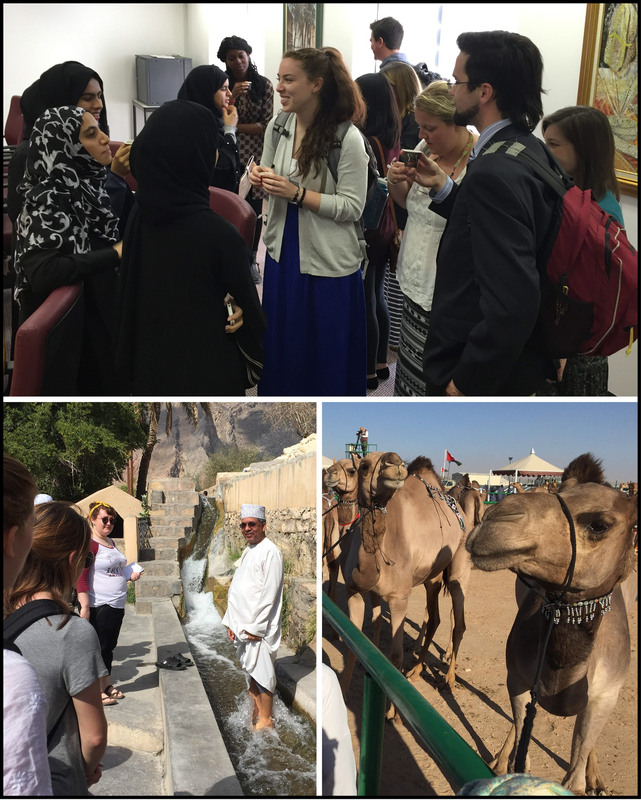 We are back from our first William & Mary study abroad program in Oman. The course, entitled Natural History and Contemporary Culture of Oman (a.k.a. Rock Music Oman), was led by myself and Music Professor Anne Rasmussen. The course enrolled 15 intrepid students and we spent over two weeks in Oman, studying its diverse landscapes and learning from Omanis about their vibrant country. 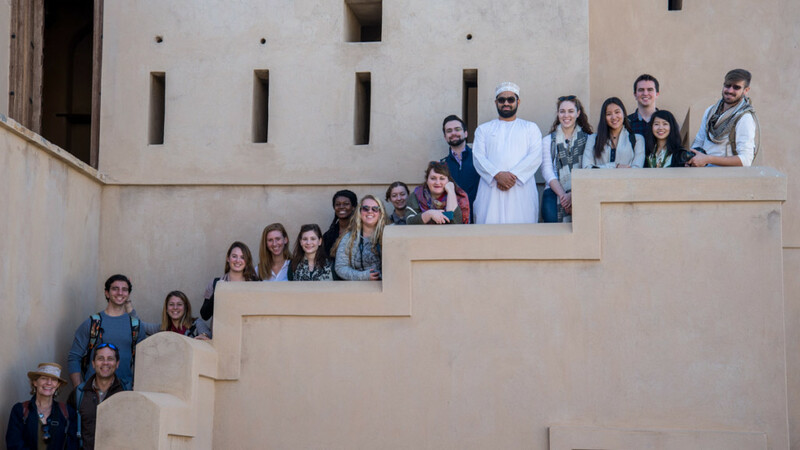 The W&M Oman study abroad program 2016 on the steps at Ibri Fort. Sultan al Farsi (in the white dishdasha) was our host (photo by Pablo Yañez). 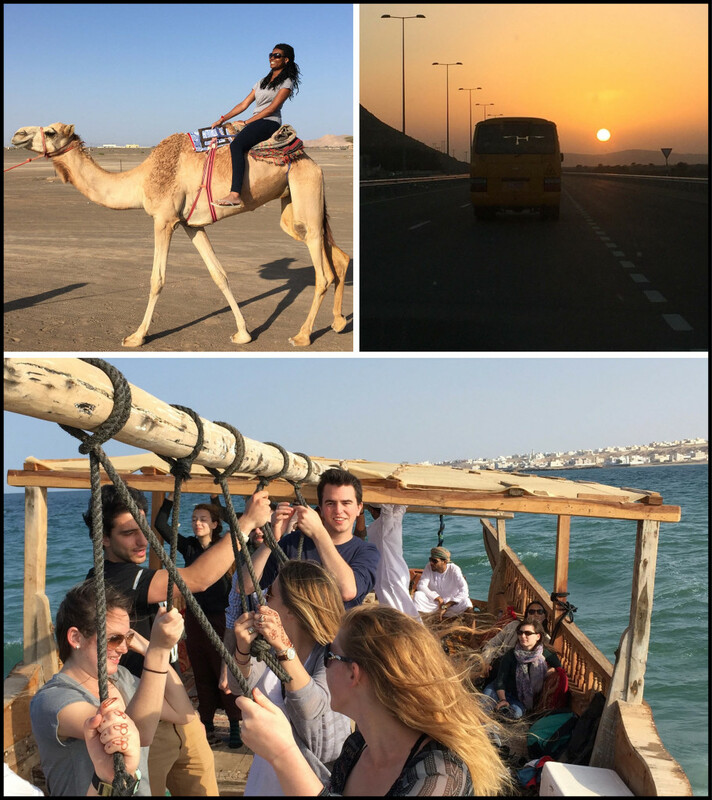 Students arrived in Muscat on January 2nd and we had four days in the capital before we rolled out for an 8-day tour of northern Oman’s mountains, deserts, and coastal ecosystems. We finished our trip back in Muscat reflecting on what we’d learned, and meeting with students at Sultan Qaboos University, the U.S. Ambassador to Oman, and a small cadre of journalists in the Omani press corps. All-in-all our itinerary was jam-packed with 14 to 16 hour days being the rule rather than the exception. Here’s a sampler from one day in the Rock Music Oman experience: on January 7th we were in the city of Ibri, and started the day early as our host Sultan al Farsi took us on a lively tour of the goat market, the souq, and the restored Ibri fort. That was followed by a lecture at the Noor Majan Training Institute by visiting scholar Bradford Garvey on Omani music. After lunch we toured Al Sulaif, a ruined and partially restored fort/town, that’s perched on tilted Tertiary strata overlooking a broad water gap. In the afternoon we loaded into our magic yellow school bus and roared out into the western desert to the Muzayanat al Ibl (think of it as a camel beauty pageant). Our host Sheikh Ahmed took good care of us as we received the VIP treatment, meeting the prize camels and their proud owners. As the sun set we headed back to town for an evening of folk dancing and Omani cuisine inside the walls of the Ibri fort. Our event-filled day ended after coffee, dates, and conversation with Sheikh Ahmed. A most amazing day. Top: meeting with students at Sultan Qaboos University. Lower Left: Dr. Abdullah al Ghafri in the falaj at Birkat al Mouz. Lower Right: Prize-winning camels at the Muzayanat al Ibl. Our field experiences included an urban hike in Mutrah to introduce Oman’s vast ophiolite, day trips to Wadi Mayh, Wadi Bani Khalid, Wadi Shab, the Ghubrah Bowl, and the bronze age beehive tombs at Al Ayn. My friend and colleague Dr. Abdullah al Ghafri taught us about aflaj during a walking tour at Birkat al Mouz. We spent a relaxing day in the Sharqiya Sands, a vast and imposing network of linear dunes. 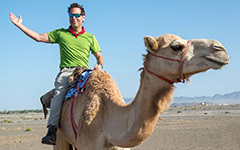 At Ras al Hadd, Arabia’s eastern edge, we reveled in the surf and sand as the sun set behind the Hajar Mountains. Top Left: Kira McFadden takes a camel ride. Top Right: Following the magic school bus towards the setting sun near Ibri. Bottom: Rolling with the waves in a dhow off the coast at Sur. An important pillar of William & Mary’s new College curriculum is the COLL 300 requirement which asks students to engage and embrace the world beyond William & Mary. The Oman program did just that. William & Mary aims to produce students who are both critical and thoughtful global citizens. Given the current political climate of vitriol and fear that’s spread across the United States and beyond, it’s critical to dialogue with people from different cultures. Oman paints a far different picture of the Arab and Islamic world than what’s represented by bombastic politicians. Check back in the weeks to come as I post more about our Oman program. As the new semester opens our students will be working on their Oman research projects, which range from geological strain analysis of Precambrian diamictites to Omani UNESCO world heritage sites to aflaj and its bearing on local biodiversity. hopefully the excessive Omanism didn’t lead to onanism!